Completion of the Cable System of the Columbia Railway, Washington, D. C.
This article, from The Street Railway Journal, April, 1895, describes the completion of Washington, DC's Columbia Railway cable line. The Columbia Railway, of Washington, D. C, is now operating by cable power. Less than a year ago this company decided to make use of the cable system on its line, which extends from the corner of 15th Street and New York Avenue, through New York and Massachusetts Avenues and H Street to Florida Avenue. In previous issues we have referred to the progress of the work, but through the courtesy of Engineer William B. Upton are now able to furnish plans and description in more detail. The route of this railway runs in nearly a straight line from the power station at 15th Street and Florida Avenue to the terminus near Treasury Building, a distance of three miles; the grade of the road was practically level, and only at one point does it cross the tracks of a steam railroad. The conditions are thus particularly favorable for cable traction, and no expense has been spared to make the road complete in every particular. The power station, a section of which is given in Fig. 3, fronts on H Street and adjoins the car house. It is of brick with stone trimmings and steel trussed and slated roof. In the engine room on the front are two E. P. Allis & Company's engines, patterns of 1890, with heavy frames. Each engine is of 200 nominal horse power, cylinders 22 X 60, steam pressure 100 lbs. As shown in the plan (Fig. 5) couplings are arranged on the main shaft, so that either engine can be used for the driving cable. An interesting feature about these engines is the method of cylinder lubrication, by means of The power station, a section of which is given in Fig. 3, fronts on H Street and adjoins the car house. It is of brick with stone trimmings and steel trussed and slated roof. In the engine room on the front are two E. P. Allis & Company's engines, patterns of 1890, with heavy frames. Each engine is of 200 nominal horse power, cylinders 22 X 60, steam pressure 100 lbs. As shown in the plan (Fig. 5) couplings are arranged on the main shaft, so that either engine can be used for the driving cable. An interesting feature about these engines is the method of cylinder lubrication, by means of the Ashton improved sight feed lubricator. The cylinder oil is contained in a reservoir capable of holding fifty-two gallons. The oil is under pressure, and by piping is conducted to each engine and fed into the cylinder drop by drop after the usual manner. In the boiler room are two Campbell & Zell water tube boilers of 225 H. P. each. The fire boxes are fitted with Fraser & Chalmers underfeed stokers, a Sturtevant blower and Westinghouse engine supplying the forced draught. Worthington steam pumps and a Berryman heater constitute the feedwater apparatus. The station and car house are lighted by arc and incandescent lights, current being furnished by a Crocker & Wheeler dynamo driven by a 7 X 10 high speed engine. The engine room outfit also embraces a set of Thompson indicators and an Ideal oil refiner. The cable driving and transmission machinery, exclusive of the engines, was furnished by the Walker Manufacturing Company, of Cleveland, O. The cable drums are twelve feet in diameter, with the Walker differential rims; the transmission drums on the same shafts with the cable drums are twenty feet in diameter, each grooved for eight two inch cotton ropes. The rope drum on the main driving shaft is twelve feet in diameter; it is connected to the shaft through a Walker-Weston friction clutch. The John A. Roebling's Sons Company, of Trenton, N. J., supplied the 31,000 ft. of steel cable. It is one and a quarter inches in diameter, Lang lay. The speed of the cable is nine miles per hour. 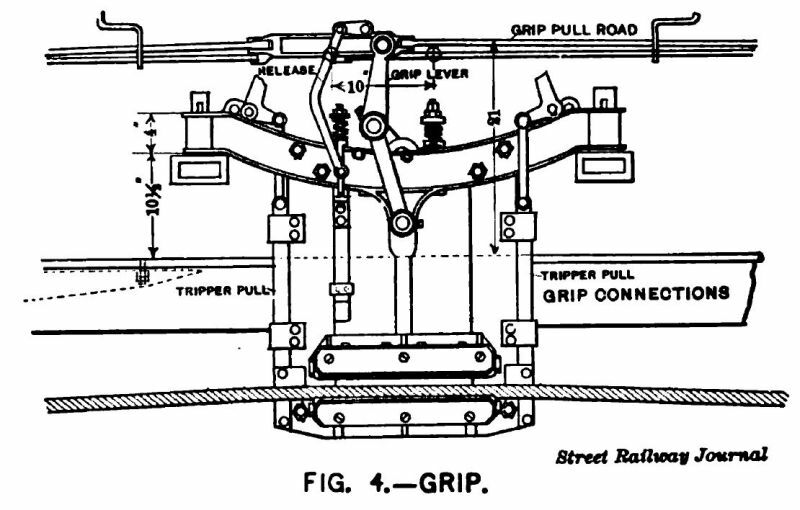 The cable tension apparatus is essentially the same as that used by the Washington & Georgetown road, but the originator of the device, Mr. Upton, has made further improvement by the addition of a counterpoise which imposes a constant strain in addition to a variable one due to the pendulous weight. This arrangement, shown in the elevation of the power station, has the effect of steadying the strain on the cable, especially under the lighter strains. An indicator at the side of the carriage shows the cable tension at all times. The track and trench construction was carried out by the well known cable contractor, E. Saxton of Washington, D. C., who supplied all materials and labor. Fig. 1 shows a section of the track construction. The details briefly specified are: Rails: Johnson grooved girder, section 86, No. 200, eighty-six pounds to the yard, six inches high, sixty-six pounds to the yard, furnished by the Johnson Company; width of slot three-quarters of an inch. Yokes of cast iron, weight 350 lbs., set in No. 1 cement, spaced five feet apart center to center; all rail joints were placed at center of yokes; joints staggered; rails secured to yokes by two one-inch hook bolts, except at joints; there four bolts were used; six-bolt joint plates used at rail joints; gauge of track four feet eight and a half inches; dimensions of cable trench 18 X 38 ins. ; walls made of five inch, No. 1 concrete; inside of trench carefully plastered with cement mortar. Cable carrying pulleys spaced every thirty feet on straight track, every ten feet on curves of 150 ft. radius or more, and every five feet for curves of radius less than 150 ft. Brick pavement between rails and narrow strip outside, laid on bed of No. 2 concrete; asphalt pavement between tracks and abutting against all brick pavement Composition of No. 1 cement: 1 bbl. Portland cement .5 cu. yd. sand, .8 cu. yd. broken stone. Composition No. 2 cement: 1 bbl. natural cement, .4 cu. yd. sand, .8 cu. yd. broken stone. The carrying and curve pulleys are of cast iron with chilled face, ground and balanced; journal bearing surfaces of case hardened steel and babbitt. The car equipment consists of twenty closed cars, twenty foot bodies, thirty feet over all, four wheel trucks, nine foot wheel base, thirty inch wheels; and twenty open cars; total length of thirty feet. These are fitted with Stirling registers, with rod ringing device, and Stirling fenders. The John Stephenson Company, Ltd., of New York, furnished the cars complete, with the exception of the grips which were supplied by Campbell & Zell, of Baltimore. It will be seen from the drawing (Fig. 4) that the cable gripping and brake mechanism is similar to that used on the Broadway cars. Bessemer steel dies are used for pinching the cable. The cars themselves are copies of the Broadway cars, but are two feet shorter. The bodies are painted blue, ornamented with nickel. The car house, which was shown in the Journal for December, adjoins the power station. The front of the building is two stories high, the second floor being used for the various offices of the road. Suitable quarters are provided for the conductors and gripmen. 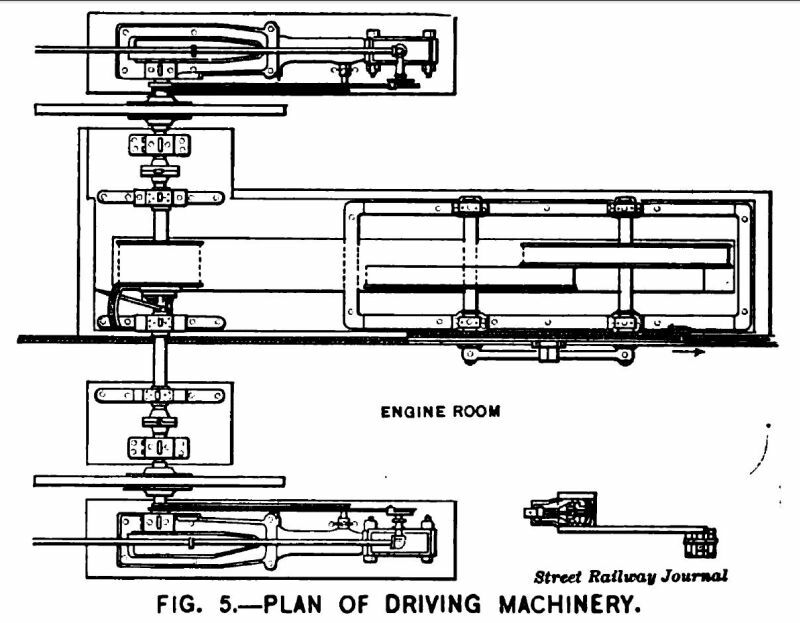 Cars can enter the house by two tracks, and are distributed to any part of the building desired by the Hathaway transfer table in the center; this transfer table is especially constructed for grip cars. The contracts for the reconstruction of the road were placed largely with local concerns. Some of the more important contracts were: Curves and switches made by the Johnson Company, of Johnstown, Pa ; steam railroad crossing by the Weir Switch & Frog Company; yokes and manhole castings by the South Baltimore Foundry; carrier pulleys and boxes supplied by the Walker Manufacturing Company; the two inch cotton transmission rope was supplied by William E. Hooper & Sons, of Baltimore.